Representatives from the University of Central Florida (UCF) were among volunteers in industry and research labs from 16 states who visited dozens of Congressional offices urging support for legislation to continue the advancement of photonics research. Photonics plays a crucial role in innovation, economic growth, competitiveness and bolstering national security. Seventy-one percent of UCFs annual Center for Research and Education in Optics (CREOL) budget is derived from federal funding. 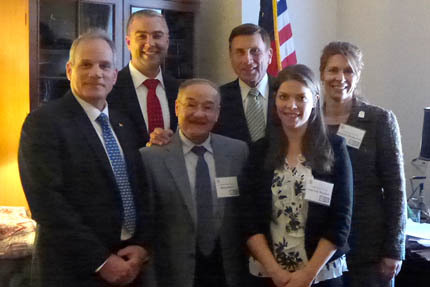 Robert Bernath, business development manager, Bahaa Saleh, dean of UCF’s College of Optics and Photonics and student Amy Van Newkirk, represented the university in Washington D.C. in late March. The team’s primary mission was to stress the importance of maintaining a certain level of federal funding to ensure CREOL remains a leading research institute. The visits were organized by of the National Photonics Initiative (NPI). Nearly 200 representatives from across the country attended the Science-Engineering-Technology Working Group (SETWG) Congressional Visits Day. The team from UCF met with six senators and House members, Senator Marco Rubio (staffers), Senator Bill Nelson, Representative Alan Grayson (staffers), Representative Patrick Murphy (staffers), Representative John Mica, and Representative Bill Posey to emphasize the critical need for federal funding for science research and to encourage them to re-authorize bills which provide financial support for advanced manufacturing and optics research. NPI volunteers in general encouraged: • The bipartisan Revitalize American Manufacturing and Innovation Act of 2013 (RAMI), to establish manufacturing institutes known as the Network for Manufacturing Innovation (NMI); the institutes would function through a public-private partnership between the federal government, local governments, universities, research institutes and industry to accelerate manufacturing innovation in technologies with commercial applications. •Reauthorization of the bi-partisan America COMPETES Act (originally passed in 2007 and expired in December 2013) to ensure American competitiveness in the global marketplace, and adding language specifying photonics to reflect the industry’s critical role in the ongoing innovation of many other sectors. •Establishment of a National Photonics Prototyping and Advance Manufacturing Facility within the Department of Defense’s manufacturing mandate, possibly through inclusion of language in the National Defense Authorization Act (NDAA); establishment of such a facility could produce critical defense applications for warfighters, as well as drive new generations of high-tech commercial applications such as a more secure Internet, enhance medical diagnostics, and portable sources of renewable energy. About NPI: The NPI is a collaborative, industry-driven campaign to advance photonics research and funding. Activities concentrate on five key areas: defense and national security, energy, healthcare, communications, and manufacturing.